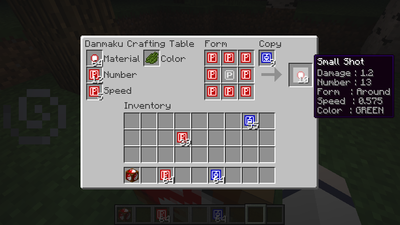 This mod add a lot of things such like weapons, foods or some magic meterials into minecraft game. – Materials that use to make some of items below. – Spam butterflies in front of the user. – Hold shift to spam butterflies around the user. – Hit a mob with it, will make a knockback to mob. – Shoot the bullets to all around the user. – The player can glide when holding it. – Hold shift when holding and right click to open the umbrella. – Create a gust to blow a mob. – Shoots 3 vertical bullets drop in front of the player. – Shoot a big bang bullet forward and take recoil. – A small sword that can reflect danmaku bullets! – Hold right click and release at the same time when the bullets reach near the user. – Hit the mob with this sword will temper up the sword, and the sword’s strength will increase. – Right click to use the effect or hold it to check more further. – Hold right click and aim into a mob to absorb a light ball. – Right click to wield a massive sword horizontally. – Shift+Right click to wield it vertically. – Throw an enomous ceiling to crush the mobs. – It falls when throw and leaves trails to where it goes also make damage with it. – Hold shift and right click to use focus homing mode. – Throw 2 amulets and it diffuses like its name. – Throw a red massive spear in front of player. – Need 3xp to make a throw. – It gives you strength when you drink it, and it also drunk you. – It gives the user 3 or 5 buffs. – The effect of this stick depends on your level, and use it with spell card. – Hold right click to charge the stars, maximum at 5. – Lv.20/1 Star – Shoots 2 set of 8 bullets around and the bullets will continue shoot rapid bullets around. – Lv.25/2 Stars – Shoot some bullets into the sky and randomly drop something…. – Lv.30/3 Stars – Make a mob shoot bullets around and drains bullets into user that give buffs. – Lv.35/4 Stars – Shoot the bullet like a vertical sea wave forward. – Lv.40/5 Stars – Make strong winds surround the user, then spread around to strike the mobs. – Dip the water and it can put the water to somewhere else. PS2. Example, if the pendulum is in the first slot, the target thing must be in the second slot. – Hold shift and right click with Sukima will teleport to where user point. PS. Can’t be crafted, but spawn from creative mode. – A workbench that can customize the bullet amount, speed, colors, and patterns. – Similar to the normally one, but this one is used for the laser bullets. – To copy the bullets. – To power up the strength of bullets. – Shoots several large orbs that do large amounts of damage to mobs. – Shoots a large rainbow heat laser with some star danmaku branching off. – Laser does 10 damage each second of contact. PS. Recipe changed – Use the red knife instead of blue. – Shoots a lot of bouncy bullets forward all over the floor. – Right click on a mob to activate. – Shoots stars and spin around for a while. – Shoots bullets fountain and drop around the area. – Shoot a rainbow barrage bullets like a ball shape, vertical waving in front of the player. – Shoot 3 set of bullets from behind the player, and it bounces around if it hits somwthing. – Shoot rapidly knifes in front of the player. – Shoot big flower bullets swirling in front of the player with some medium shots. – Span 5 big laser shot, then rotate clockwise and anticlockwise. – Spread rice shot around player and goes around for a distance. – Shoot some big shot randomly and leave some medium shot trail, after that the red trail will slowly flow around. – Shoot bullets forward in circle shape toward mob. – Shoot a fountain of colorful bullets. – Shoot 4 explosions bullets into a mob and continuously explode 4 times. 2. Put the mod into …/.minecraft/mods folder.